The Gabriel Hounds by Mary Stewart was first published in 1967. The setting is the Middle East, High Lebanon and with that and just about everywhere else that is mentioned such as Syria now being completely unrecognisable having been bombed to hell and back – I found that aspect of the book really sad. Politicians – HUH! Apart from that the book was just okay, I’ll give it a 3 on Goodreads I think, for me it dragged a fair amount although it did heat up quite a bit towards the end. When Christy reaches her great-aunt’s palace it’s evident that the place is falling apart and her aunt is on her last legs. She’s being attended by some suspect characters and Christy realises that her appearance there isn’t at all welcome. She’s determined to get to the bottom of it all. As I said, it does get more interesting towards the end although for me it didn’t come close to her usual suspense and I found the romance side of it to be distinctly icky! 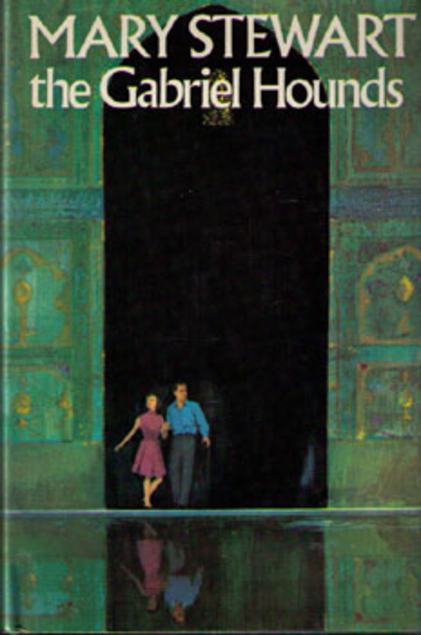 My Brother Michael by Mary Stewart was first published in 1959 – a very good year I think! But my paperback copy is from 1971. The story begins with Camilla Haven sitting in a crowded cafe in Greece where she’s on holiday on her own after the break up of a long term relationship, She’s writing a letter to her friend back in the UK and bemoaning the fact that nothing exciting ever happens to her, no sooner has she written that when a man throws car keys onto her table and says that the car he has ordered is waiting for her. There’s been some sort of mix up as she hasn’t asked for a car but eventually Camilla decides to take the car and drive it to Delphi, it’s apparently a life or death situation that the car is delivered there and she had been planning on visiting Delphi anyway. There she meets Simon who is a Classics teacher back in England and Simon is on a mission to visit his brother’s grave and to discover more about his death. Michael had been in the British army and involved with the Greek resistance fighters during World War 2 – a terrible time for the Greeks as the Nazis treated them so badly, but to make matters worse the various factions of Greek freedom fighters fought amongst themselves, so it was difficult to know who to trust. As the story unfolds it transpires that Camilla also finds it difficult to know who is on her side. I really enjoyed this one, Mary Stewart was obviously very fond of Greece and the Greeks, as I recall she used it as a setting a few times. 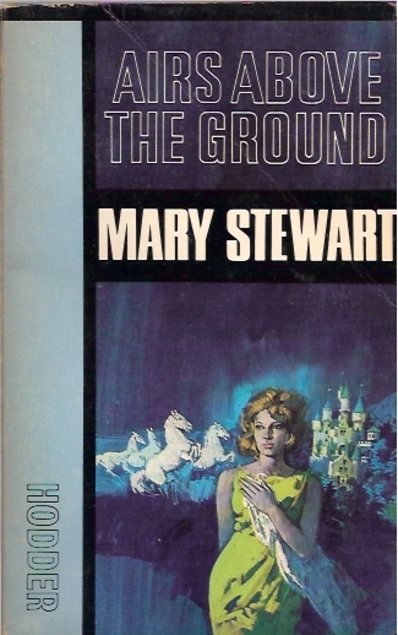 There’s plenty of suspense in this one and I can’t help thinking that Mary Stewart would have had a far higher profile and reputation if she had been a male author. 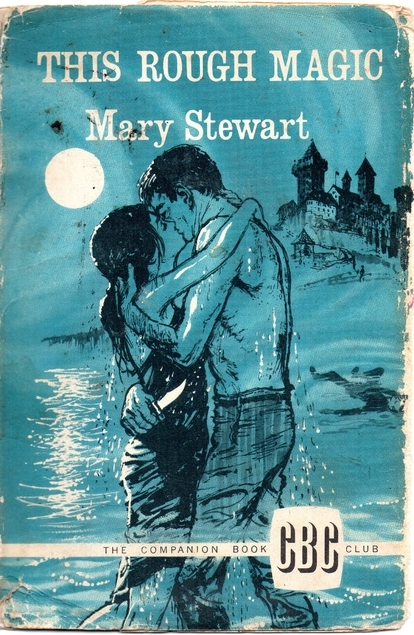 This Rough Magic by Mary Stewart was first published in 1964 and the setting is the Greek island of Corfu, where Lucy Waring, a young aspiring actress is invited to stay with her sister for the summer. Her acting career has come to a bit of a halt so it’s an ideal opportunity for her, especially when she discovers that her sister’s neighbour is a famous thespian Sir Julian Gale. His son Max is staying with him, in fact it seems that Sir Julian isn’t in the best of health. It’s a wee bit of an English enclave on that part of the island, there’s also a photographer who is working on a book of photos of the island and its animals and a dolphin features fairly prominently. But there’s plenty of local colour and of course romance. Corfu is apparently supposed to be the setting for Shakespeare’s The Tempest from which Stewart took the title for this and which is one that I’ve been intending to read for absolutely yonks now, and I really wish I had got around to it as there are so many quotes from it in the book. 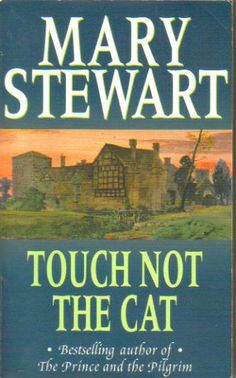 Mary Stewart was really well-read. I enjoyed this one, there’s plenty of suspense although I don’t think it was quite as good as Nine Coaches Waiting. I read this one for the Read Scotland 2017 Challenge and 20 Books of Summer. Madam, Will You Talk? 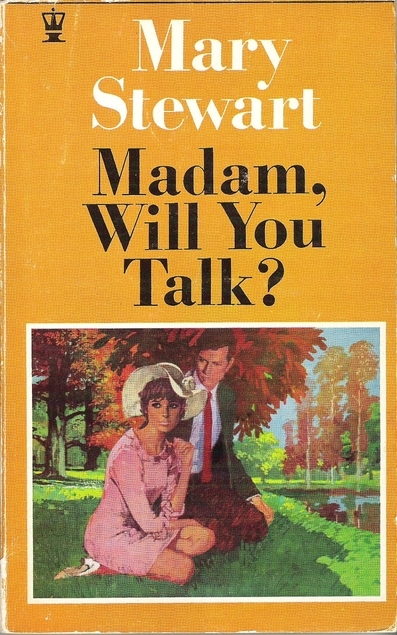 by Mary Stewart was first published in 1955 but my copy is from 1969 as I think you would have realised from the cover. When I was reading this book I didn’t realise that it is actually the first book that she had published, it certainly doesn’t read like a first effort. Charity is a young widow and when she decided to go on a road trip to Provence she asked her close friend Louise to accompany her. Not long after arriving at their hotel Charity befriends David an English teenager who is staying there with his French step-mother. It transpires that David’s father Richard has been tried for murder but has been acquitted, and when Charity overhears a conversation she realises that Richard is in France and is trying to track down his son. She is sure that David is in danger, he certainly seems to be terrified of his father. I really enjoyed this book which is a mystery, adventure, romance and travelogue all rolled into one. There are some lovely descriptions of the countryside and there’s a hair-raising high speed car journey with Charity as the expert driver, something quite advanced and new for a female character in 1955 I think. 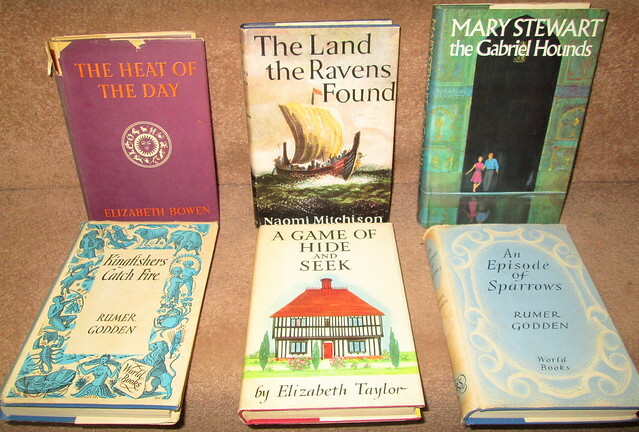 I’ve been looking for these Mary Stewart books and although I had been hoping to find hardbacks in a secondhand bookshop, I decided to settle for the copies in the photo below when I found them in a Stockbridge, Edinburgh bookshop. The covers are so of their time. Airs Above the Ground is a 1967 reprint, it was originally published in 1965. 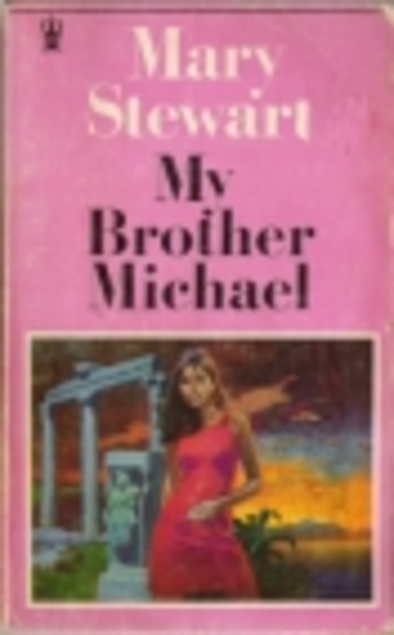 Mr Brother Michael was published in 1959 but this reprint was published in 1971 – the eighth impression. 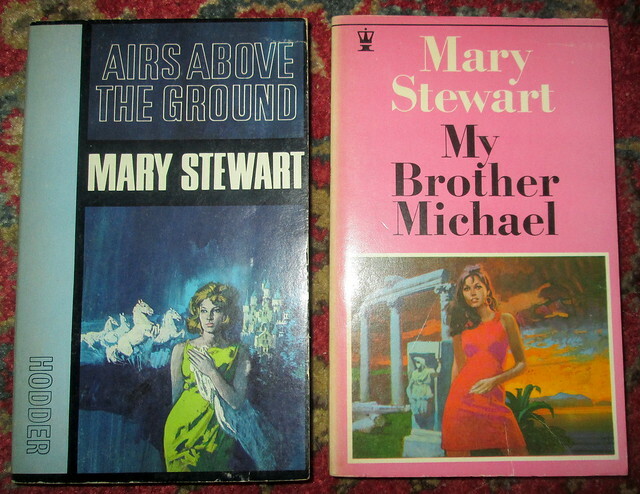 I did read a lot of Mary Stewart’s books way back in the 1970s but I think that I missed Airs Above the Ground and My Brother Michael back then, so I’m really looking forward to reading them soon – for the Read Scotland 2017 Challenge of course. If you are a regular visitor to ‘Pining’ then you’ll realise that Stockbridge in Edinburgh is my favourite stamping ground for books, but when I’m there I never take any photos of the place, I’m too busy perusing book and charity shops and also it’s quite a busy area so it would be impossible to take photos without getting a lot of people in them. So if you want to know what Stockbridge looks like have a keek here. 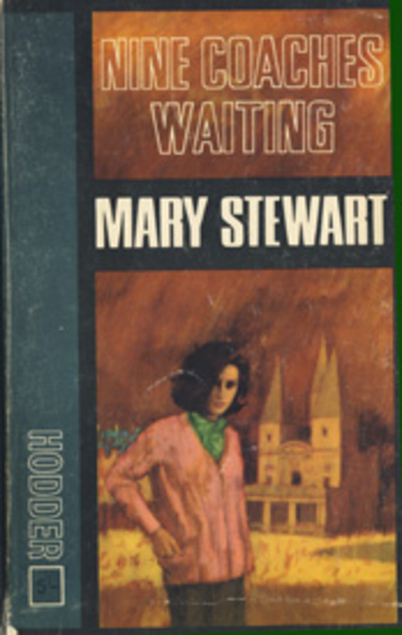 Nine Coaches Waiting by Mary Stewart was first published in 1958. The book is a mixture of mystery and romance and has an almost Victorian feel to it as Linda is a young English woman, alone in the world and in need of some way of supporting herself. Linda’s mother had been French and Linda had lived in France in the past so she is a fluent French speaker but when a job opportunity comes up for her and it seems that it is only open to an English woman she decides to hide her ability to speak French. Linda becomes governess to a young boy Phillippe whose parents have died recently. It means that Phillippe has inherited the family estate as his father was the eldest of three brothers. But Phillippe’s uncle had been in control of the estate for some years as Phillippe’s father had been more interested in his archaeology career which kept him away from the chateau that should have been his home. It isn’t long before Linda realises that Phillippe’s life is in danger and she picks up various interesting pieces of information as her employers think that she doesn’t speak French. I always enjoy Mary Stewart’s writing and I found this one to be a page turner, full of suspense and great holiday reading. The title Nine Coaches Waiting was taken from a Renaissance play by Cyril Tourneur – The Revenger’s Tragedy and although there are twenty-one chapters in the Stewart book nine of them are headed by a coach number with Ninth Coach appearing as the name of the last chapter. The coach chapters all deal with car journeys that are important to the storyline. I know that someone who reviewed Nine Coaches Waiting on Goodreads was perplexed as to why the book was titled as it is. My copy of the book is a very old paperback so maybe later versions of the book had those chapter headings removed, or maybe that reviewer just didn’t read the book very closely.